It’s that time of year to check for termites, so it’s no surprise that we are hearing news of termite swarms in northeast states like Massachusetts and New Hampshire. 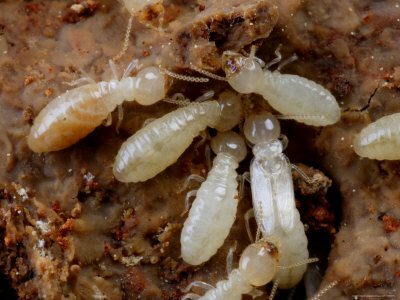 Use this Modern Guide to Termites to determine if you have these damaging pests in your home, and when it’s time to call termite control in Boston, MA. There are about 45 species of termites in the United States, but the most common termite to Massachusetts and areas of the northeast is the Eastern subterranean termite. Unfortunately, these also happen to be the most damage-causing termite in the country. A big reason is that unlike other termite colonies, a single subterranean colony can number in the thousands. In fact, damage to homes costs owners millions of dollars each year, and home insurance does not provide coverage in the case of termite destruction. Termites within a colony have different jobs, and their job will determine how they look. The above picture is of a “worker” termite who is responsible for the damage in your home. There are also winged termites, and large, orange-colored “warrior” termites. Regardless of their size, overall termites themselves are small; the key to determining if you need to call termite control in Boston, MA is if you find termite damage. Subterranean termites prefer “softer” wood, which is what most homes are made up of. They go for the “guts” of wood, or the inside, so their damage has a distinct layered honey-comb look like pictured above. But the damage caused by these termites isn’t very obvious on the outside of the wood. Your wood may just look like it’s been water damaged, be buckling or swollen. Knowing where to look will help you figure out if you need termite exterminators in Boston, MA. 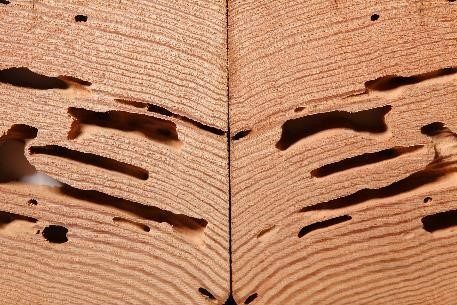 Where Should You Look for Termite Damage? While subterranean termites typically thrive in a soil-based environment, a suitably damp environment will work just fine. Termites can exist both within your home, and outside of it. If you have faulty plumbing that produced a leak, the wall cavity near the leak would create a perfect environment for them to thrive. They also enjoy damp basements, and if you look near the foundation of your home, you might be able to spot a nest. Otherwise, subterranean termites aren’t very picky, and will go after furniture, cabinets, floors, and windows made of wood. Wherever the termite damage is, you may also be able to pick up a scent similar to mildew or mold. If you find any damage that looks like termites, consider it time to call Modern Pest Control. Because termites can destroy structures quickly, there’s a general rule that it’s better to be safe than sorry. Overall, we’d rather incur the costs of extermination than out of pocket costs repairing severe damage to your home that insurance doesn’t cover. 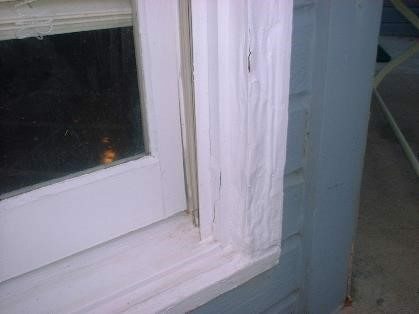 So even if you’re not sure termite damage is what you’re seeing, don’t wait to find out. Modern Pest can determine the level of infestation, areas of damage, and create a very specific, effective extermination program for your home.